Mike should have just taken that circa 2004 circulating album's worth of songs and put *that* out. It sounds far better, features less remakes (and the remakes he *did* do on that one included stuff like his remake of "Everyone's In Love With You" which, while far from a masterpiece, is much better than his new remake of "Getcha Back"), and I think it would have garnered him better reviews from the few publications who *did* bother to review it. But, as was confirmed by Mike in his recent Mojo interview (and something I suspected and mentioned several months back before the album came out), it was the record label who asked for the "classic" remakes. I tend to doubt they just thought it would be an interesting thing to do, but rather they probably felt putting a bunch of classic song titles on the package (and slapping a BB logo on the sticker on the cover) was the only way the album would be worth granting a record deal to Mike. As it is, even with a cheap price tag for a 2-disc set and an album's worth of "classics", the album predictably pretty much sank and didn't even chart on the main Top 200 albums chart. In recent years, legacy acts such as KISS and Journey have done distribution deals with Wal Mart, and part of the deal was a 2nd disc of re-recorded classics from the back catalog. It's all part of the short sighted view of legacy artists in general. But it's not particularly analogous, as those bands would have been trying to go from a "regular" record deal to a huge deal with Walmart. I'd venture to guess both of those bands could have gotten a less lucrative but still mainstream record deal (perhaps with Eagle or Frontiers or something like that as other older bands with solid core fan bases have) without having to bundle a second disc of re-recorded "classics." In Mike's case, to score a deal *at all* he apparently had to bundle a disc of re-recordings, and re-recordings of *another* band rather than a disc of "Mike Love" re-recordings. Those other bands are guaranteed to shift hundreds of thousands if not millions of units on day one by cutting those deals with Walmart. Mike did the re-records and all it really accomplished was that he got a distributor instead of just selling the album himself on CD Baby or Amazon-On-Demand or something. Let us also remember that the label that put Mike's album out is part of the same big conglomerate as the publisher of his book, so I wouldn't be surprised if both of those projects were somehow bundled together in one deal. But, I don't see how the label would logically think the album would shift more copies with a disc of Beach Boys remakes. You don't understand why a label would think "California Girls" and "Good Vibrations" (etc.) would garner more attention than song titles like "All the Love in Paris" and "Ram Raj?" They priced it essentially the same as a one-disc album, and put a bunch of recognizable song titles on it. I have little doubt it *has* moved more copies due to that second disc. It's just probably in the hundreds of copies rather than thousands. "Mike Love" does not have a ton of name recognition. But if you put an "of the Beach Boys" sticker on the cover and put a *full album* worth of recognizable Beach Boys songs in the package, a casual fan is much more likely to buy it. What I don't understand is why the label would think a 2017 version of a 50+ year old classic would garner attention. Maybe I need to take off my "music geek" glasses to see their logic. I imagine it's kind of a tipping point thing, where the casual fan looks at the CD's song titles and thinks "eh, I guess I'll pick one up... even if I hate most of the new stuff I still get all the classics!" I don't love the logic but it does make sense. .....if, say, it was 1995 and you can find this album in any store. Now, Best Buy soon won't be carrying CDs, while I'm pretty sure places like Wal Mart and Target don't carry half as many CDs as they used to. So I'm gonna say that the whole "impulse buy" thing has mostly went out the window with the way things work now. Now, granted somebody may decide to buy a copy on Amazon due to the tracklisting, but one might also assume the person would sample some of the remakes and hear how horrible those versions are and be turned off to the entire project. And the blurring of the soloist /BB guy is useful to sales , especially at shows such as 2.14.18 where "The Beach Boys" performed Unleash the Love to a huge backdrop of its cover. I’m sure the label Mike used does have the mentality that it is 1995. However, even in an age of samples and streaming, having those names of BBs tunes on there makes the odds of this album selling more much greater than if people just saw Ram Raj and 10,000 years. For those of us who sample the songs, and understand the making of this album - that second disc is not for us. That second disc is for the the casuals at the concert who see the names of those Beach Boys songs and are more tempted to buy them if they can hear those classics...not realizing they are about to take a brass knuckle sucker punch to the eardrums when Mike’s auto-tuned nasal phalanx comes ripping through the stereo system. That second disc is likely for impulse buy concert goers. When it comes to marketing Mike's disc of remakes, I think maybe what we all feel *should* be the case is being conflated with what is *actually* the case. The label *absolutely* asked Mike to do the disc because it was a marketable angle/would grab some additional sales, etc. There's NO other reason to ask for it. We can argue *how much* such a disc might impact sales. 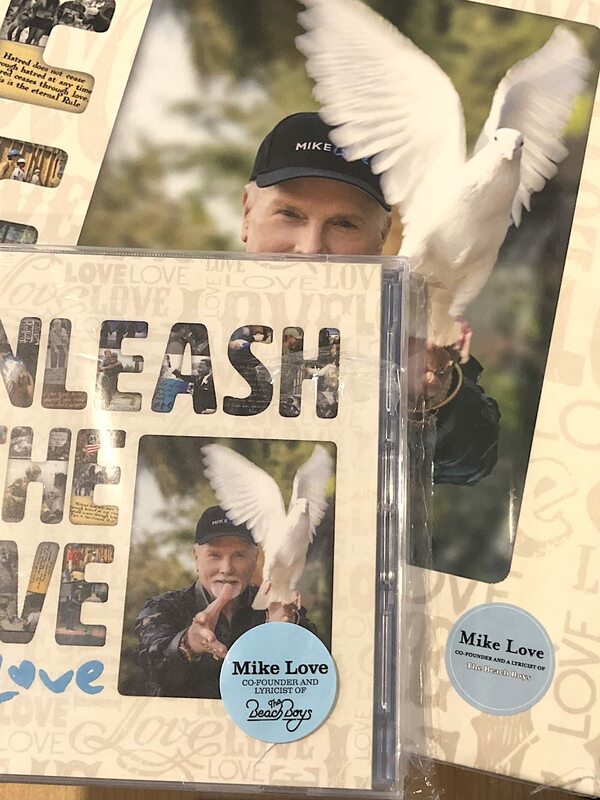 But I don't understand in the incredulity about the idea that a label would see that a disc of "Mike Love Original Songs" would garner X amount of interest, while attaching a second disc of recognizable, classic songs (which also held to remind you that Mike Love is "of the Beach Boys!") would attract some degree MORE attention/sales, etc. At it's core, it's the same reason "Sounds of Summer" sells more than a new album from any of these guys. It's the same reason K-Tel asked Badfinger to re-record "Come and Get It" in the early 80s. It's the same reason Mike did that "Salutes NASCAR" CD. It's the same reason that Hallmark "Songs from Here and Back" wasn't filled with live rare deep cuts. These are all artists that aren't relevant musically in present day. So if they're inclined to do new product, a label isn't crazy for thinking if the whole thing is wrapped up in some well-known songs, it'll probably sell at least a little bit more. The only potential drawback is that "new" material will be unfavorably compared to the old stuff, or in the case of re-recordings, the new recordings are compared unfavorably to the originals. I guess Mike accomplished that *too*, but I have little doubt that he probably moved another 1,000 or so units by sticking that hits CD in the package. Some artists have enough clout/reputation, that they don't have to latch on to the old stuff, at least when it comes to making new music. Brian Wilson can score a record deal without bundling his album with a disc of BB greatest hits. McCartney can score a deal without bundling old hits. Mike Love, as a solo artist, apparently can't. Or he didn't shop around. Also keep in mind that one possible reason Mike recorded the oldies again that we may not find out about for awhile is the possibility that he'll try to shop the re-recordings for use in commercials, movie trailers, movies, etc. This has been one of the main reasons many older artists have done re-recordings. They then can license their recordings directly, cutting out the copyright holder of the old recordings. So....I say.....Brian....go back and re-record these songs over the top of Mikes. Make your own re-recording of Getcha Back .etc... and go ahead and use your name "Brain Wilson" pushing for the revenue flow and lets see who wins this battle. So going forward after these guys are done touring.....Mike and Brian both "may" have revenue streams from actions they can take now......what about Carl's heirs and Al from the point of view of BRI ? And HJ......great thought provoking post...and one last glass of Chard !!! The BB are becoming /have become the 'pop' version of the New Christy Minstrels. A version of the show continues......line ups will change...as they have. Picked up the vinyl edition of UTL which came out a while after the CD. The sticker is different from the CD edition. I wonder if Mike got in trouble for using the Beach Boys logo? Also noticing that the sticker now says *a* lyricist. I'm sure it was changed grudgingly; I'm surprised they didn't try to hide the word "a" by shrinking it down to size 1 font. Is the album being sold at the concession stand on Mike's...I mean, the Beach Boys' tour this year? No, but you'll get a coupon for $2.00 toward a botox injection if you mention myKe luHv. Credit to RubberSoul if his post on page 1 instigated BRI to take action on the label. When is the OSD Unleash the Dove listening party this summer? We need an OSD rifftrax of the album! Stay tuned. And just to be clear, it's Uhnleesh thu Duhv. Finally he's ofering a real deal! OSD, I want to be invited to the Unleash the Dove party. \P)ebble is geting me through the Trump presidency. Of course you're invited, however there is somewhat of a roadblock ahead. No one I know has the damn CD!! Perhaps we can stream it though my laptop and listen to it via my 1960 transistor radio that I bought with my lawn cutting money. Just dawned on my that I never did do my video review. Oops. Now OSD, Wouldn't it be nice! That be nice. Thanks for the heads-up on this and taking the time to snap the pic. I recall from the outset noting that it was absolutely inappropriate for Mike to use the actual BB logo; a few scoffed at this and didn't see a problem. He (and the others) can *absolutely* advertise that they are "of the Beach Boys", etc. But using the logo implies endorsement from BRI. As I said when I first saw the pic, I can GUARANTEE that if Al had put the actual Torrence-designed BB logo on his "Live in Las Vegas" CD (or any other for that matter), he would have been sued into oblivion. I'm glad someone at BRI is looking at this stuff and hopefully taking appropriate action. I mean, who knows, maybe the manufacturer of the vinly sticker just got lazy. We don't know anything for sure. But dropping the logo *and* changing the misleading verbiage implying Mike was *the* lyricist for the band seems to indicate a strong likelihood of someone having said something. Powered by SMF 1.1.21 | SMF © 2015, Simple Machines Page created in 0.312 seconds with 21 queries.